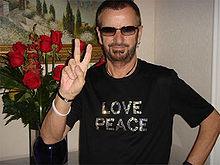 Today is Ringo Star’s 70th birthday and he has asked that everybody in the world raise their fingers into the peace salute at noon today, wherever you are. I recently posted Life Just Is – my take on life. In this present moment there is no separation and no attachment to the past. This entry was posted in News and tagged My Thoughts by AyPee. Bookmark the permalink. If you want tickets for Chris Howard events in the uk please use my affiliate links, below.